Whether if it’s for your employees or family, sharing your calendar comes with a variety of benefits. Most notably, it improves communication and efficiency, boosts productivity, and balances assignments. Most people don’t realize some of the ineffective ways to share your calendar. 1. Not using cross-platform access. Did you know that digital consumers own 3.64 connected devices? That makes sense, considering that you’re going between your laptop, smartphone, tablet, and wearables throughout the day. As such, you may not be using devices and calendars that aren’t compatible with each other. For example, if you have an iPhone and use a calendar app that’s only available for iOS, then you can’t use that calendar on your Samsung Galaxy Note. Instead, make sure that you’re using a calendar, such as Google Calendar, that can be accessed across multiple platforms. This way you only have to create and share one calendar. 2. Sharing personal events with your co-workers. There are plenty of people who prefer to use one calendar for everything. And, you can’t blame them. It’s much easier to keep track of one calendar. However, this is a problem when sharing that one calendar for work since your colleagues can see everything on your calendar — such as a doctor’s appointment. Personally, I have two calendars; one for work and another for my family. This way my team doesn’t see any of my personal information. 3. Sharing your calendar at the wrong time. There’s an art to when you should share your calendar. You don’t want to wait until you need something, but you also don’t want to share the calendar at the last minute. There has to be a balance. For example, if you want to share your calendar with your family and assistant for an upcoming trip, sharing it 24–48 hours before you leave is ideal. If there’s a task that you team needs to complete by Friday, sharing it on Monday is cutting it close. Before sharing your calendar, take into consideration urgency and deadlines so that it can be shared at the right time. Even if you were able to use the Outlook app to send this, the recipient may not still be able to access the calendar. What’s the deal? Turns out that the migration from Exchange 2010 to 2016, for example, had never been completed. You can easily rectify this issue by following this advice from Lavanya Rathnam over at TechGenix. 5. Cloud storage hasn’t been enabled. Some online calendars, like Apple Calendar, will require cloud storage. In this case, if you want to share your calendar with your family, you need to set up Family Sharing. This way your calendar can be accessed by everyone you invite and it ensures that it stay up to date with iCloud. 6. Sharing with too many people. Sure. It’s easy to share your calendar with as many people as you like. But, just like when scheduling your meetings, it’s better to have as little people involved as possible. The reason? Having too many people reviewing and editing a calendar can make it cluttered and confusing. So, follow the Two Pizza Rule made famous by Jeff Bezos and only share your calendar with a small group of people. This should only be key stakeholders. There’s a reason why you shared your calendar; to keep everyone on the same — whether if it’s at home or in the office. Additionally, it prevents you from having to remind your team or family about upcoming appointments, events, tasks, of chores. They see what they need to do and when it has to be done. But, if you’re still reminding your spouse about a school play or your team about a deadline, then why did you bother sharing your calendar? 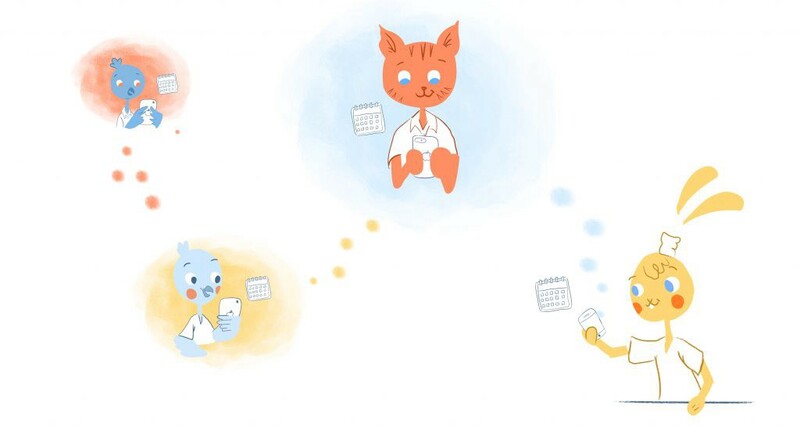 A shared calendar keeps everything running smoothly, prevents micromanagement, and creates autonomy. 8. Not connecting to other calendars. Instead of adding holidays, birthdays, events, schedules, and entries manually, connect to other online calendars. This way you can set-up a shared calendar for the next year automatically. If you use Google, you can quickly access this information from your contacts and emails. 9. Knowing little about the person on the other-end. Let’s say you just hired a new remote employee or working with a new client. Obviously they’ll need the right information to do their jobs, but what what other info do they need? For example, a virtual assistant requires your daily schedule and upcoming travel plans, but they may also want to know when your “off hours” are so that you aren’t bothered. The only way you’ll know this is by actually getting to know the people on the other-end. This is why I schedule frequent one-on-one time with my team or potential client. You can also use a tool like Sales Navigator. 10. Not using additional features. Being able to color-code events. Notification reminders for appointments and deadlines. The ability to create recurring events. Denoting all-day events with checkmark. Appointment slots that can be viewed and booked. Using these features make it easier to create a shared calendar. It also makes it possible for others to quickly review what’s scheduled. 11. Forgetting to update your calendar. Let’s say that you have to reschedule a team meeting. You not only have to update this change, your team also needs to receive a notification of the cancellation. This way they’re not showing-up to a cancelled meeting. Using smart scheduling technology Calendar will automatically reschedule this cancelled meeting so that there won’t be any conflicts. 12. Not hiding early morning/late night hours. Every calendar displays the whole day. The problem is that you’re not using every hours — particularly late night and early mornings, like between midnight and 5am. As a result, these unused hours eat-up a lot of space. Some calendars allow you to hide these hours when you’re not getting much done. You used to be able to do this with Google Calendar by enabling labs. And, here’s a trick on how to do this in Outlook. Play around in your calendar settings to see if you can hide early morning/late night hours, like when you’re sleeping. 13. Failing to set working hours. Calendars, like in Outlook or with a paid Google Apps account, allow you to select the days of the week that you’re in the office and the hours that you’re available. This way others know when it’s the best time to schedule events/meetings with you. 14. Not staying on top of holidays. Do you work with people internationally? Then you should know when they’re out of the office because it’s a holiday for. This way you won’t schedule anything on those specific data — and they’ll also know when you won’t be available. Most calendars allow you to add holiday calendars for other countries. When creating events for your calendar, you only want to include the essential information. You don’t want to over-detail events. For example, if there’s a team meeting at a local coffee shop, you don’t need to share the contact information, map, menu, and second-by-second agenda. Your team already has this info, so that just need to know who’s attending, the time and place, and overall purpose of the meeting. At the same time, you don’t want to under-detail events. For example, don’t share a calendar with your team that blocks out all afternoon for “Meeting.” They need to know exact times, where the meeting will take place, and the type of meeting it will be. 16. Not adding a timezone. Most calendars will adjust time zones, like when you’re traveling. But you can also add additional time zones. Some calendar and scheduling will automatically detect time zone differences. This comes in handy when you’re collaborating with a remote team since it ensures that everyone will appear at an event, like a conference call, at the same time. 18. Forgetting to add relevant attachments. Instead of cluttering your calendar with too much information, you can just sound an attachment instead. For example, your shared calendar could block out 2pm to 2:30 pm for a team meeting. But, you’ll attach the agenda and any other relevant materials. Visuals, like photos or graphs. 19. Not enabling your calendar to work offline. What happens if you lose power or your internet connection isn’t reliable? You still need to be able to make sure it works offline and is synced. This also guarantees that when others view the calendar it will be current. 20. Not using past events to your advantage. Have you noticed that every Tuesday at 3pm you have a team meeting? Instead of manually entering that information into the calendar, just create a recurring event. Furthermore, smart calendars can use previous data to make suggestions, such as meeting times and locations. This means you can go ahead and block that time in the shared calendar. 21. Changing ownership to the wrong individual. Let’s say you can’t make an event and transfer ownership to someone else. This makes life easier since the even go forward without a hitch. However, make sure that you change ownership to the right person. 22. Opting not to make your calendar public. Unless there’s information that doesn’t need to be shared publicly, this makes it easier for others to keep tabs of important dates and know what your schedule looks like. Some calendars, like Google, require you to make it accessible. 23. Not embedding your calendar. You don’t always need to share your calendar via email. Some tools, like Calendar, allow you to embed it on your website. This way clients can schedule a meeting with you by just booking when there’s availability on your calendar without going back-and-forth. 24. Not adding events from other apps. Your tasks, projects, and events aren’t just available in your online calendar. This means a Trello project card, Evernote list, or Eventbrite event can be automatically added to your calendar — as long as they integrate, which most do. 25. Using too many calendars. Finally, as alluded to earlier, you don’t want to create too many calendars. It may make sense to have separate calendars for your meetings, daily work schedule, and team projects. The truth is, that makes things much more complicated and confusing for you and your team. Again, I have a personal calendar and professional calendar. It keeps everything lean and mean. Originally published at www.calendar.com on August 9, 2018.